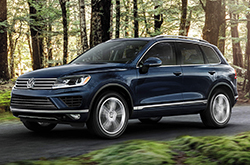 Virtually unchanged for 2016, the luxurious Volkswagen Touareg in Orlando is built to haul your family and friends around in comfort and style. Read our full VW Touareg review below for all the details. Hop inside the Volkswagen Touareg in Orlando and you'll quickly notice the top-notch materials and sleek dashboard that's packed with high-tech components, like LED ambient lighting and a handsome gauge cluster that's supplemented with a crisp graphic display. Not to mention, the large, standard touchscreen interface with sharp graphics. This two-row, five-passenger SUV is also roomy and offers reclining seatbacks. Plus, rear-seat legroom provides comfort to even the tallest passengers, while the seat bottom is high enough to provide rear passengers both solid thigh support and a nice outside view. 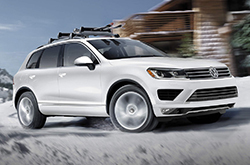 Safety-wise, every Touareg gets antilock disc brakes, traction and stability control, front side airbags, full-length side curtain airbags and post-collision automatic braking to keep the SUV in place after a crash. Also included on the standard equipment list is the Technology Driver Assistance Package. While the entry-level VR6 Sport trim adds a review camera, a blind-spot warning system, automatic emergency braking, a lane-departure warning system and a frontal collision warning system. Off-road conditions are no problem for Touareg either. That's in part due to the sophisticated all-wheel-drive system that easily moves the SUV over light snow, light-duty trails and washboard roads with ease. 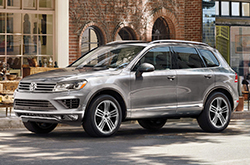 Powered by a diesel engine, the V6 Touareg in Orlando rides smooth and achieves excellent fuel efficiency. VR6 models get a 3.6L V6 engine that delivers 280 horsepower and 266 pound-feet of torque. For those looking for more torque, the TDI V6 is the way to go. This brawny, turbocharged 3-liter V6 turns out 240 horses and a burly 406 lb.-ft. of torque. Additionally, the eight-speed automatic transmission offers seamless upshift and responsive downshifts without breaking a sweat. For more information, keep reading our 2016 Volkswagen Touareg review below. When you compare Volkswagen's latest Touareg model head-to-head with the 2016 Acura MDX, BMW X5 and the Mercedes-Benz GLK-Class, you'll see that it outshines the competition. The Touareg's passenger-oriented cabin features and budget-friendly sticker price are just a few of the enticing characteristics that shoppers will appreciate. Many drivers in Orlando choose it because it's a fantastic value; compare its price to the competition to see for yourself. Catch a glimpse of our Quick List underneath this text to find out more! Thank you for reading our complete 2016 Touareg review, written by David Maus Volkswagen South's expert authors. Our reviews are drafted by experienced automotive writers - it's just another resource we provide as a prominent Orlando area Volkswagen dealer. Make wise decisions when it comes to your next auto purchase - don't take guesses! Each passage is packed with data and vehicle features in a layout that's easy to understand. 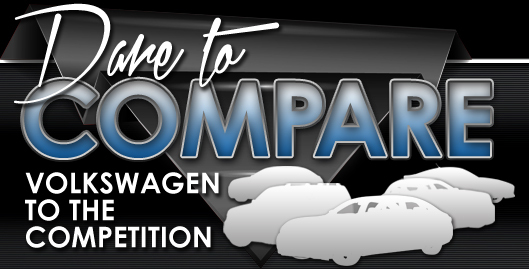 Want to read other Volkswagen car comparisons and reviews? Then visit our digital research library, where you'll learn about other new vehicles for sale now at David Maus Volkswagen South.